Once more, we have a welcome visitor at the blog. The excellent dm gillis returns with another short story. I'm quite the aficionado of Ray Bradbury, whose words are my favourite narcotic. I do not lie when I say this story reminds me of a classic slice of Bradbury, his short story The Pedestrian, which is said to be the match that lit the flame of Fahrenheit 451 in Bradbury's mind. So settle down for a fragment of a dystopian future. Every word I have said is true. But the moon, the moon is a lie. I say this into the veracigraph. An agent in a crumpled white shirt and loose tie holds a microphone to my mouth. We’re in a large damp concrete garage, lit by a few light bulbs hanging from the ceiling. The machine’s internal brainbox hums and clicks, analysing my answer. Then a green light appears on its panel. I’ve passed. I bite my inner cheek, and show no surprise. I’ve practiced endlessly for moments like these. A steady tone of voice; a relaxed diaphragm. The machine has pegged me a true believer. I remain handcuffed to a metal chair, but I live another day. As an exercise, I run the official narrative through my head: Of course the Moon is a lie. 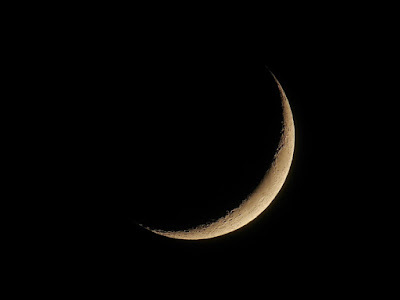 So are its orbit and phases, especially the crescent phases, its dark side and light. The tides are a function of the whirling, shifting planet. The Moon is the enemy’s greatest symbol, a massive manipulation, placed there by the Eastern Faith States. Huge projectors, controlled by vicious Imams, in secret locations beaming it onto the night sky, and sometimes during the day. Watching over the west — over all of us who live in freedom. It is a cruel weapon of mass destruction, the Prime Minister has spoken. All Moon literature, fictional or scientific, recent or historical, are EFS lies. Only the truly radicalised believe otherwise. I feel dizzy in my chair, and ask for water. A full glass is placed at my feet, but the handcuffs mean I cannot reach it. The agent in the crumpled white shirt smiles. I’m eighty years old, in chronic pain. Rationing has made me weak. A decade of self-imposed isolation has nearly erased my memory. I no longer have conventional memories, only flashbacks. Colours mostly. Odd. Flashes of lush blues, pale purples and pinks. Vague recollections of flowers. What are they? I’m a danger to no one. In spite of the pain, I am amused. It occurs to me that it’s my age that makes me dangerous, if I am at all. I know truths about the Moon that come from before the dismantling of the internet, before mass communication was banned, books incinerated. I’m from a time when radicalisation was merely a basic adolescent awakening of empathy and endeavour, not a mass doctrinal psychopathy. “You want a cigarette?” says the agent. He pulls one from a deck for himself, and lights it. The Gov, short for Government. A word shortened to encourage trust and familiarity, intimacy even. The Gov is family, a warm and welcome friend. A lover. The agent inhales extra deeply, proudly to make a point. The smoke he exhales is as blue as moonlight on wet pavement. “I’m truly in trouble this time, aren’t I?” I say. He half shrugs, and picks up and opens a tattered file. He reads. His lips move. “You were a university prof?” he says. “Mathematics,” I lie. Or perhaps it’s not a lie. I no longer know for sure. A door opens to my left and a woman in a business suit walks in, carrying a black leather attaché case. As she approaches me, I see that she has a young but motherly face. Her lipstick is the red of jingoism, however. Not a colour from my flashbacks. It’s a deep shade of blood, derived from propaganda posters. She nods to the agent. He disappears into the dark. “Hello, Professor,” she says to me, pulling off black kidskin gloves. I haven’t been called that in over a decade. “How does it flow now?” I ask. She might be correct, I think. “It seems you actually professed philosophy,” she says. “It was well received,” I say. “The question is too ironic to answer,” I say. She retrieves another document from her case. Enemies on your side. She gets it. Clever woman. “So you’ve read it,” I say. This is unexpected, a bit bewildering. “So, you’re bribing me,” I say. Strangely, I suddenly see orchids. The colours. I raised them once, my God. Now I remember. The joy! My belly tightens. There’s a wicked hope in my gut. “May I have orchids?” I say. dm gillis is a writer who gazes at the moon from Vancouver. Follow him on Twitter here or on his blog.